CLOSE MENU Hear the SONGS! Click here! This now IS the most complete & accurate version of this on the internet! - Robb A. 3/27/19 - Finally have started looking at this again and doing some updating for newer browsers (Real Audio is not working anymore, MIDI links need tweaked). And now I've COLORIZED the page (as in Lyrics, Chords and Comments are all in different colored text) for easier reading. AND added MP3 PLAYERS onto page! 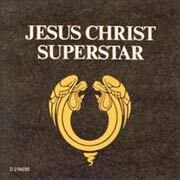 7/28/12 - Added "Pete's Sheets" - sheet music and tab from Pete in the UK that he made for his performance of JCS with a company in England a few years ago. 5/15/09 - Added some minor chord corrections from Georges in France and found a wrong word in "Last Supper" ("Jaded Mandarin" section). 7/7/07 - Fixed some blunders in the code that made some lines all messed up. 3/27/07 - Added strumming acoustic guitar parts and Lyrics to my MIDI file for "Ev'rything's Alright". 8/1/06 - Added my MIDI file for my "Damned For All Time" to the MIDI page. 2/18/05 - Added tablature to John 19:41 for solo guitar. Also added a MIDI file for my arrangement. <<The floating popup menu on the LEFT will jump to the different songs ON THIS PAGE as does the table of links below. so you can listen, learn, and play along with the real thing! NEW! PDF's of this ENTIRE PAGE - Tab, Chords & Lyrics !! "Could We Start Again, Please?" Vocal improv end of "Heaven On Their Minds"
Bass line to "This Jesus Must Die"
Acoustic picking to "Pilates Dream"
Dist. elec. guitar & flute opening to "Damned For All Time"
Bass line to "Damned For All Time / Blood Money"
Acoustic picking to opening of "The Last Supper"
I am a guitarist (keyboardist, vocalist, web designer in Columbus, OH) who loves to play JCS music. All the music. Not just the guitar parts. I love to learn to play the bass, flutes, horns, strings, piano, etc. all on the guitar. That's why this page uses tablature. So on this page you'll find some guitar tablature which might prompt one to say, "Hey man, the guitar doesn't do anything like this." That's right. It may be the flute, horn or piano part. I don't have any sheet music for JCS. I've learned all this music by ear with minimal help from existing chord charts found on the internet (most were incorrect). I created this page to help me remember all the parts I had learned. I also thought I could share it with friends and then we could get together and jam on JCS songs. Then I thought, "Why not share it with the WORLD?". So here you go. I keep adding little bits each week, some more chord grids or tab or MIDI files so check back and see what's new! My next goal is to have The Best JCS MIDI Collection in the World! I've collected all I could find and now I'm tweaking them and creating entirely new MIDI arrangements of the songs in excrutiating detail! Check 'em out at the MIDI Page! Click for tablature to "Overture"
4. Soft strings doing "So long Judas. Poor old Judas"
[Use these suggested chord forms on the opening so that the chords and the "main riff"
(The very first D and G chords are mimicing VERY low voicings on Piano and used only once. The rest are around the 5th fret to 7th fret. We are occupied - Have you forgotten how put down we are? And they'll crush us if we go to far. Won't you listen to me. Apostles:   What's the buzz? Tell me what's a'happening? Jesus:   Why should you want to know? ------   Why are you obsessed with fighting? Times and fates you can't defy? You'd understand it less than I! Umm, What I need right here and now! on women         of her   kind! But to let her stroke you, kiss your hair is hardly in your line. They only need a small excuse to put us all away. Jesus:   Who are you   to criticize her? ------   Who are you   to despise her? How can you say that? How can you say that? Jesus:   Not one - not one of you  ! Here is where "Then We Are Decided" is in the movie. And relax think of nothing tonight. Could have been saved for  the  poor. Three hundred silver pieces  or  more. Matter more than your feet and hair! If we try we'll get by so forget all about us tonight. To save the poor from  their lot? Look at the good things      you've got! The pharisees and priests are here for you! Annas:   Listen to that howling mob of blockheads in the street! Miracle wonderman - hero of fools? Caiaphas:   One thing I'll say for him: Jesus is cool. ---------   By leaps every minute - he's top of the poll. Blood and destruction because of one man! All:        Because, because, because of one, 'cause of one, 'cause of one man. Priest 3:   What then to do about this Jesus-mania? Annas:      How do we deal with the carpenter king? ---------   Then John was when John did his Baptism thing? ---------   The stakes we are gambling are frighteningly high! All:        Must die, must die, this Jesus must, Jesus must, Jesus must die! They are a curse, they should disperse! Sanna Hey Sanna Ho Sanna! Sanna Ho Sanna Hey, Superstar! Jesus:   Why waste your breath moaning at the crowd? Nothing can be done to stop the shouting! ------   Did you see I waved? Christ, you know I love you! Did you see I waved? And who've terrorized our people for so long? Crowd:   Christ, you know I love you - Did you see I waved? As if he hadn't heard. Crying for this man . Will you touch will you mend me Christ? Won't you touch will you heal me Christ? Will you kiss you can heal me Christ? Won't you kiss won't you pay me Christ? (repeat 2nd Crowd verse 2 more times. He scares me so ! Jesus can't control it like he did before. Why are we the prophets? Why are we the ones? Caiaphas:   We'll pay you in silver - cash on the nail! Caiaphas:   Then we can't fail. Judas:   I don't need your blood money! Caiaphas:   Oh that doesn't matter our expenses are good. Judas:   I don't want your blood money! Tablature of acoustic picking to opening of "The Last Supper"
Till this evening is this morning life is fine. I must be out of   my   head! Ten minutes after I'm dead! One of you denies me! Apostles:   Not I! Who would! Impossible! What are you saying? Jesus:   Why don't you go do it? Judas:   You want me to do it! Judas:(overlaps Jesus)  You want me to do it! Jesus:   Get out! They're waiting! Get out! They're waiting! Oh ho ho, They're waiting for you. Ahh..
Till this evening, in this morning life is fine. Jesus:   Will no-one stay awake with me? Will none of you wait with me? I'm not as sure as   when   we     started. Would I be more noticed than I ever was before? Would the things I've said and done matter any more? Ah oh, Why should I die? You're far to keen on where and how and not so hot on why Al________right I'll_______ die! Ah! Just, just watch me die!nbsp;       Ah! Just, just watch me die! See-he-he how, see how I die!bsp;       See-he-he how, see how I die! Oh, yea, See how I die! Bleed me, beat me, kill me, take me now - before I change my mind! Judas:   There he is! They're all asleep - the fools! Jesus:   Judas - must you betray   me with a kiss! Peter:   What's the buzz? Tell me what's happening. What's the buzz? Tell me what's happening. Peter and Apostles:   Ahh, What's the buzz? Tell me what's happening. Jesus:   Put  a - way   you - r  sword! Have you men proved at all worth while? You know what your supporters feel? Tell me Christ how you feel tonight? Do you plan to put up the fight? Now we have him! Now we've got him! Now we have him! Now we have got him, Now! Annas:   There you have it, gentlemen - what more evidence do we need? Judas thank you for the victim - stay a while and you'll see it  bleed! Take him to Pilate! Take him to Pilate! Peter:   I don't know him ! Peter:   I had to do it, don't you see? ------   Or else they'd go for me. Pilate:   Who is this broken man     cluttering up my hallway? We all know that you are news - but are you king? King of the Jews? Pilate:   What do you mean by that? You're Herod's race! You're Herod's case! Hey JC, JC please explain to me? You've been getting    quite a name all around the place. Come on, King of the Jews! What is it that you have got that puts you where you are? Feed my household with this bread, you can do it - on you head! Or has something gone wrong? Why do you take so long? Hey! Aren't you   scared of me, Christ? Mr. Wonderful Christ! Get out you King of the...         Get out! Get out you King of the Jews! Get out you King of the Jews! Judas:   My God! I saw him - he looked three-quarters dead! slime and the... slime and the mud! Does he love, does he love me too? Does he care for me? You have murdered me! You have murdered me! Murdered me! Murdered me! And why is this? Was Herod unimpressed? Do you have the first idea why you deserve it? Pilate:   Then you're a King? Pilate:   But what is truth? Is truth unchanging law? -------   We both have truths - are mine the same of yours? Mob:      Crucify him! Crucify him! Pilate:   What do you mean - you'd crucify your King? Mob:   We have no King but Caesar! Mob:   We have no King but Caesar! Crucify him! -------   This man is harmless so why does he upset you? Mob:      Crucify him! Crucify him! Crucify! Crucify! Crucify! Crucify! Crucify him! Crucify him! Crucify! Crucify! Crucify! Crucify! x3234x    Why do you not speak when I have your life in my hands? Pilate:   You're a fool Jesus Christ. To keep the peace, so crucify him! You'll be deported, crucify him! To keep to peace, so crucify him! Die if you want to, you, misguided martyr! Die, if you want to, you innocent puppet! Why'd you choose such a backward time and such a strange land? Who are you? What have you sacrificed? Who d'you think besides your self's the pick of the crop? Buddha was he where it's at? Is he where you are? Could Mohammed move a mountain or was that just PR? Did you know your messy death would be a record-breaker? ------ Who are you? What have you sacrificed? Jesus Christ,                   Tell me, tell me. Jesus Christ                    Don't get me wrong! Superstar                       Don't get me wrong! Judas: Jesus! I only want to know! ------ Well, tell me, don't get me wrong! I only want to know! Jesus! Jesus! I only want to know! Oh, tell me. Don't get me wrong! I only want to know! Ahhh oh! Jesus! I only want to know! Hey! Jesus! Ahg ! I only want to know! I want to know! Oh, Jesus! I only, I want to know now! Oh, oh, oh, Jesus! Oh, oh, oh, I only want to know! Hey! Jesus! I only want to know! ------   Who is my mother? Where is my mother? My God My God why have you forgotten me? Father into your hands I commend my spirit! I thank you for giving me a "base" from which to start.